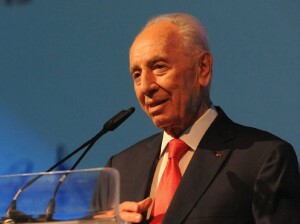 President Shimon Peres befinner sig på statsbesök i Nederländerna. President Peres är på statsbesök i Nederländerna och gav igår kväll ett tal inför det nederländska parlamentet. Efteråt mötte han ledamöter för en frågestund om Mellanöstern. I sitt tal nedan talar Peres bland annat om sin vision för ett Mellanöstern baserat på vetenskap och en modern ekonomi. The founder of the Zionist movement, Theodor Herzl, wrote in his journal: “I see suddenly a city rising from the plain, without mountain, river, or sea. This is The Hague. Evidence that will-power can make cities rise. Of the three dangers that threaten the Middle East – war, terror, hunger – poverty looms today over the others. Poverty claimed more victims today than the swords of yesterday. President Rouhani’s address to the United Nations must stand the test of real implementation. Today it is just a declaration, in a rhetoric competition. Furthermore, the realities of today in Iran are in stark contradiction to his address. The construction of a nuclear bomb is a fact not a phrase. The building of long range missiles capable, of carrying nuclear warheads continues. It is a danger to the entire world. Nobody on earth threatens Iran’s existence. Our record provides us with a licence to keep on dreaming because yesterday’s dreams gave birth to today’s miracles. You are a miracle by making land from water and we follow you as a miracle by making land from desert, what was considered impossible became a reality. Our age is facing dangers and difficulties but it also has a clear call for hope.